Basic texting messaging is still popular with a lot of people, and research from 2015 shows that a whopping 97 percent of Americans use SMS at least once a day while in emerging markets such as Africa SMS is still widely used and trusted. This is the motivation behind click-to-message ads. 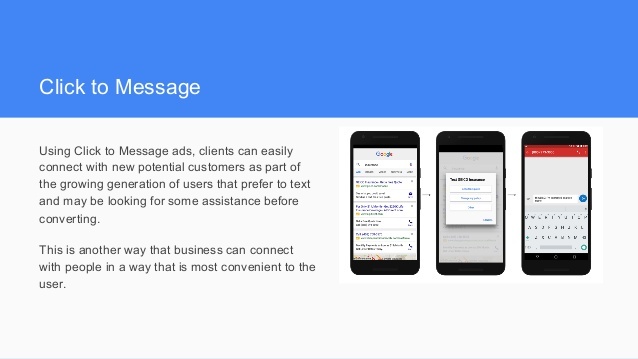 Click-to-message ads will allow advertisers an additional communication channel or lead generation channel by adding a text the business option directly from search. This will allow a user who searches on their mobile device for a service to immediately contact the business via SMS from a paid search ad. As the customer searches for relevant keywords that are being targeted by your Adwords campaigns they will be shown an additional click to message icon within search results. The user then taps the message icon, their default SMS app will start a pre-defined message. The predefined message is crafted by the business within AdWords, but can be edited by the client. Who may want to ask for additional information such as opening hours, the day's menu and other relevant information they would like from the business. How do I use Click-to-message Ads? Message extensions are only shown to people on phones capable of sending and receiving text messages. Message extensions also require your business to have a phone number that is able to receive, process, and send text messages. Click the Campaigns or Ad group tab. Click the View menu, then select “Message extensions”. Click the Campaign or Ad group tab, then select the campaigns or ad groups you want to add the message extension to, and then click Done. At the bottom of the table, click + New Message. Click Advanced to restrict the message extension to certain dates or hours of the day.